Effipro Cat is for use in the treatment and prevention of infestation of fleas for up to 4 weeks & ticks for up to 2 weeks in cats. Effipro can be used on Kittens from 2 months of age and/or weighing more than 1kg in bodyweight. 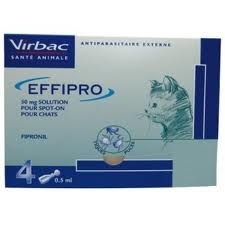 Effipro Cat administration: by topical application to the skin, 1 pipette of 0.5ml per cat. Follow the instructions on the packet for correct application. Apply every four weeks to maintain flea cover.